The Alliance’s main office is located in New York City, but our Regional Affiliates can be found around the country. 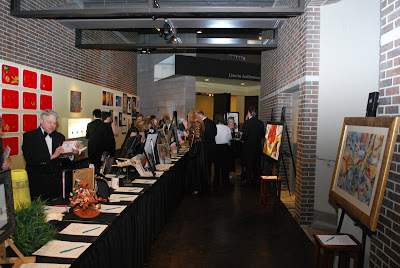 Here’s the scoop on the Fort Wayne Museum of Art, our local partner running the regional Scholastic Art & Writing Awards in Northeast Indiana and Northwest Ohio. Today’s guest blogger, Alliance staff member Kat Hendrix, works with our Regional Affiliates nationwide. Our Regional Affiliates are some of the hardworking people behind The Scholastic Art & Writing Awards – and also an important part of our history. For the last three years, as the Senior Manager of Affiliate Network & Partnerships, I’ve worked with the Alliance for Young Artists & Writers’ Regional Affiliates across the country. These are the wonderful people that work behind the scenes to make The Scholastic Art & Writing Awards a rewarding opportunity for their communities. They dedicate late nights and weekends to help students and teachers learn about the program, support them in the submission process, convene panels of professional jurors and provide exhibition opportunities and public ceremonies. Their hard work results in thousands of student submissions each year. Today, this robust network encompasses almost 100 organizations, including museums, nonprofits, school systems, newspapers and universities – a big change from the days when the program was run by two people out of an office in Pittsburgh. The Regional Affiliate Network has a rich, fascinating history. In 1923, The Scholastic Awards were founded in Pittsburgh as a small writing program by a visionary man (and Scholastic Inc.’s founder) Maurice R. Robinson. A few years later, The Awards expanded to include visual arts; in 1928, an exhibition of Award recipients was held at Carnegie Institute’s Fine Arts Galleries. The program grew over time from dozens of entries, to hundreds, to thousands, to tens of thousands. In 1940-41, department stores were invited to sponsor a regional exhibition, and within a few years more than 50 department stores, newspapers, shopping centers and TV stations sponsored regional programs. This enabled thousands more students to participate and expanded the exhibition opportunities to local communities. Through this growing network, the number of people administering the program increased from the 2 or 3 individuals at the Scholastic offices in Pittsburgh to dozens more people across the country associated with a multitude of organizations. It’s always people behind the institutions that provide the structure to move ambitions forward. In light of that, on behalf of the Alliance staff, we’re sending a big thank you to all of the Regional Affiliates for your daily inspiration and the selfless work that you do on behalf of teenagers with creative talent across the country. Your efforts do not go unnoticed. If you are interested in learning more about the Regional Affiliate Network of the Alliance for Young Artists & Writers, please contact me at khendrix(at)artandwriting(dot)org. Photo, above: Visitors view work on display at student exhibition organized by Fort Wayne, Indiana Regional Affiliate Fort Wayne Museum of Art. Every year, individuals who help coordinate The Scholastic Art & Writing Awards in Massachusetts are charged with a unique mission: find the strangest or most outrageous student submission. With almost 60 years of history, these coordinators have seen their share of interesting work! “Each year we are blessed with all types of unique art works. Some pieces have comedic value. 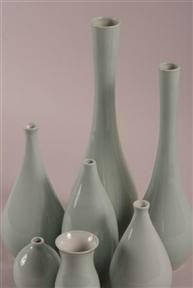 Other work is dramatic and thought provoking,” says Massachusetts Art Region Coordinator Tim O’Connor. “We remember a very unusual portfolio which won a $50,000 Binney & Smith and Scholastic scholarship. It was a series of paintings and sculptures with headless men in black suits – some with bowler hats.” This year, a Medford student created and submitted a sculptural dress using photocopied dollar bills – inspired by the outrageous fashion of pop star Lady Gaga. The Massachusetts Art Region celebrated its 60th Anniversary this year and has a long history of sponsorship by The Boston Globe. In the early 1990s, teacher Dr. John Michael Gray adopted the program under the auspices of the New England Art Education Conference, Inc. and joined forces with his partner, Tim O’Connor, to co-manage the program. Sixty years later, the region is thriving more than ever with the highest number of submissions in its history this year (10,000 works of art!). The region has also had a profound impact on art programs in Massachusetts. In secondary schools around the state, quality art work is often referred to as “Globe show work.” “In other words, there is a basic correlation between what is thought to be excellent art work and its connection to the Scholastic Art Awards program,” explains O’Connor. “Art programs that have been successful in The Scholastic Awards program continue to receive funding and support.” In addition, thousands of visitors view the annual regional exhibition, and students and teachers are celebrated at a ceremony. Their favorite part of running the program? “Knowing that we are making a difference in keeping art education alive and well in Massachusetts,” says O’Connor. During the 2010 National Events, Gray and O’Connor will accept the Excellence in the Field Award, given annually to an outstanding Affiliate for their service to The Awards. 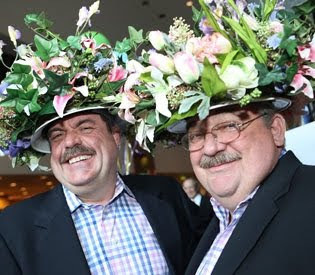 Photo, above: Massachusetts Regional Affiliate Coordinators Dr. John Michael Gray and Tim O’Connor model floral hats. Since Shannon and the volunteer-run Oregon Art Education Association took over the local Scholastic Art & Writing Awards program five years ago, it’s seen incredible growth: from 300 submissions in its first year to over 3,000 submissions from over 1,180 students in 59 different schools this year. Oh, and did we mention Shannon is also an amateur axe thrower? 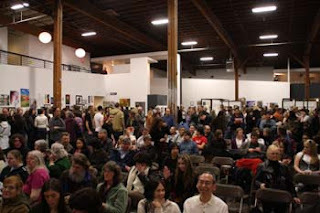 To see more artwork from Portland, Oregon, visit their online gallery. Though the Alliance for Young Artists & Writers is a nonprofit organization based in New York City, we work with 96 Regional Affiliates around the country to run The Scholastic Art & Writing Awards state by state. These affiliates include newspapers, libraries, nonprofit organizations and art centers.